Stayed for 2days. It was wonderful. The hosts were super friendly and the boat was superbly decorated with comfort. They also had a cat looks just like my princess so that was a bonus! The location was perfect all the attractions and tourists places were walking distance. Especially 10min walk to the central station. Only the downside is now my husband wants to buy a houseboat after staying here. I would 200% recommend if you want to experience something diffrent than hotels in the city. We just loved this place! Defenetly will recommend our friends to stay at this great houseboat. Location is just perfect. Hosts are very friendly and helpful! Everything about this place is perfect. We loved our stay and will be back again soon. What a great place to stay within 15 minutes walk of the train station in Amsterdam and within walking distance to almost all downtown Amsterdam. A continental breakfast was provided of cold cuts, cereal, bread and spread and coffee. We had the canal tour boats passing regularly and there's a distinct motion felt when on board. 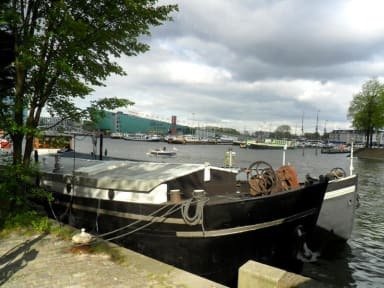 We love Anna Houseboat and would book it every time we visited Amsterdam. The Captain was great, friendly, kind and very accommodating. We loved the security. An original accomodation in the expensive city center of Amsterdam. 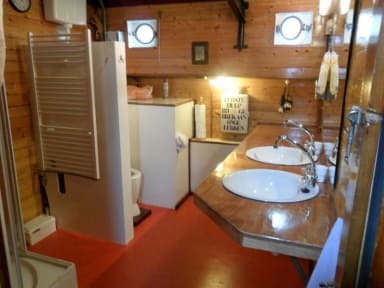 The boat is cosy and equipped with everything needed. The owner This is nice and uncomplicated. Overall it was a very good stay. Not bad for a couple of nights, staff are friendly and helpful. Be aware that they only take 2 people and if your a single person you will have to pay double the room price. This caught me out as a single woman and was surprised when the price doubled.